I understand flowers, I understand dinner, and even a small gift, but isn’t a $349 iPod Touch raising the bar just a little too far? It’s also not going to do a lot for your romantic life to see your partner buried in an iPod touch downloading and playing apps. Is this is another sign that the Apple team need to get a few more women involved in their branding and advertising processes? But then – what would I know – I’ve nobody to give one of these to this year anyway. What?!? 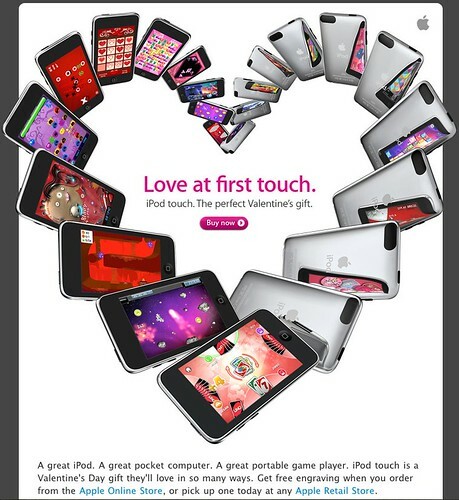 An iPod touch or similar is the LEAST i’d expect for Valentines day. I think Apple is spot on with what women think! The more money spent on us the better, especially if what we get at the end is pretty. FYI I’m joking, but come to think of it, I have no qualms with Apple introducing some healthy competition to Valentines day presents :) Feminism… Pah!